Unexpected predominance of Archaea in a cool hyperacidic environment. When we came for first time to sample Parys Mountain old copper mine on the Isle of Anglesey, we did not expect that a tiny stream would become a real treasure chest. From this very acidic site (pH 1.3-1.6) we have isolated and characterised a new archaeal genus and species, Cuniculiplasma divulgatum from a new family Cuniculiplasmataceae (order Thermoplasmatales). Comparative genomic analysis of Cuniculiplasma strains, which we isolated from Parys Mountain and Iberian pyritic belt site and a metagenomic assembly from a sibling organism from California pointed at a remarkable degree of conservation in their genomes (1,2). Later, we described the association between C. divulgatum and its ectosymbiont (or ectoparasite) “Candidatus Mancarchaeum acidiphilum” (“Micrarchaeota”) and reported on the analysis and evolutionary patterns of this first ungapped genome in DPANN Superphylum (3). It was quite logical that our next step towards better understanding of microbial diversity of this hyperacidic ecosystem would be the assessment of the entire acidophilic microbiome and spatial distribution of microorganisms inhabiting water and sediment subsystems. Shotgun metagenomics and SSU rRNA amplicon sequencing of DNA samples revealed that Euryarchaeota accounted for 67 % from the whole community, with the prevalence of Thermoplasmata (58%). Within Thermoplasmata, one particular group, “E-plasma”, without isolated representatives was in a majority (up to 43.5 % of total metagenomic reads) (Fig). Among archaeal taxa, Cuniculiplasmataceae, “Candidatus Micrarchaeota” and “Terrestrial Miscellaneous Euryarchaeal Group” (TMEG) archaea were present in low numbers. TMEG archaea were earlier considered an “environmental clade” linked to Methanomassilicoccales-related archaea (4). 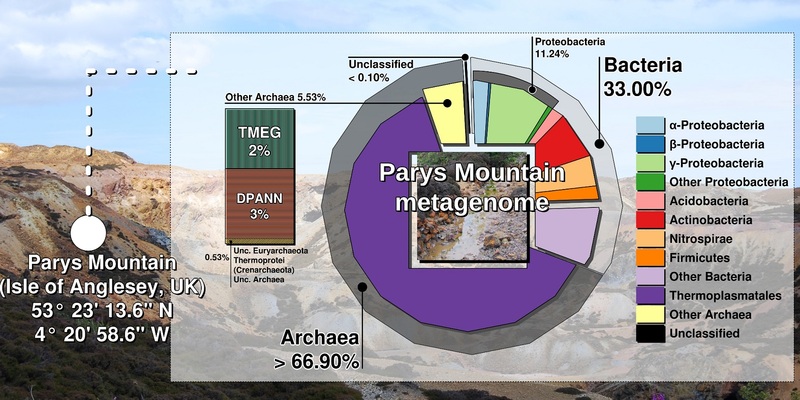 Our global phylogenetic analysis of TMEG archaea showed strong clustering of Parys Mountain clonal variants with sequences detected in other acidic and moderately acidic places, pointing at the affiliation of this group with a new order within Thermoplasmata. We also observed that this group of acidophilic organisms was often overlooked in acidic microbiomes. Highest numbers of archaea and in particular, Thermoplasmata were found in sediment samples, in contrast to the aqueous subsystem, where bacteria were in the majority. Furthermore, our analysis of microbial diversity in enrichment cultures pointed at the significance of sample pre-treatment, which could be used for isolation of cell wall-deficient archaea. Overall, our results were counterintuitive: it is commonly accepted that acidophilic bacteria dominate low- and moderate-temperature environments, exemplified by Parys Mountain, which is exposed to the cool maritime climate. 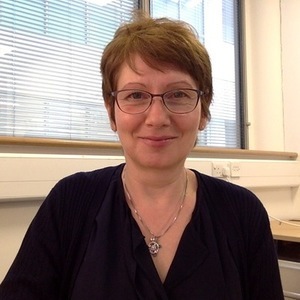 Many questions related to acidophilic Thermoplasmata still need to be addressed, e.g. the functions of predominant and “rare” community members and the reason of a very limited fraction of Thermoplasmata being cultured. Therefore, we are looking forward to sampling Parys Mountain in the near future. 1.Golyshina, O.V. et al. The novel extremely acidophilic, cell-wall-deficient archaeon Cuniculiplasma divulgatum gen. nov., sp. nov. represents a new family, Cuniculiplasmataceae fam. nov., of the order Thermoplasmatales. Int J Syst Evol Microbiol. 66(1), 332-40 (2016a). 2. Golyshina, O.V. et al. Biology of archaea from a novel family Cuniculiplasmataceae (Thermoplasmata) ubiquitous in hyperacidic environments. Sci Rep. 6, 39034 (2016b). 3. Golyshina, O.V. et al. “ARMAN” archaea depend on association with euryarchaeal host in culture and in situ. Nat Commun. 8, 60 (2017). 4. Söllinger, A. et al. Phylogenetic and genomic analysis of Methanomassiliicoccales in wetlands and animal intestinal tracts reveals clade-specific habitat preferences. FEMS Microbiol Ecol. 92(1), fiv149 (2016).